Blue is the color of the sky, the sea, blue jays, maybe your car... you get the point. So, match the sky or sea with these fantastic little Blue #6 Coin Envelopes from JAM Paper! They're tiny enough to securely hold your small items, and colorful enough that you'll never lose them! #6 Coin Envelopes feature an easy-to-use gum flap closure and measure in at 3 3/8 x 6. They're of the highest color quality and are made of some of JAM's best paper. You won’t be disappointed with how they feel. 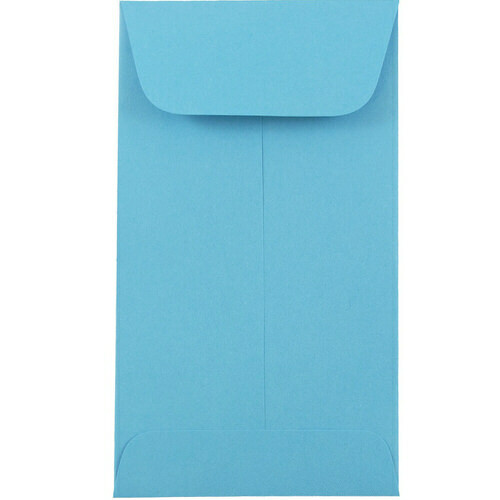 If you're not so into blue, check out our other colors on Coin Envelopes page! Buy multiple colors and you can color coordinate your small item storage. #6 Coin envelopes are sold in packs of 25 with extra savings when you buy 1000 or more envelopes! So gather up your stamps, coin, jewelry, buttons, paper clips, and whatever else--and start storing them in our Blue #6 Coin envelopes.